victoriana, originally uploaded by jahansell. Another great house on the Green - I think often these houses were small when first built, and then added onto many times over the years so they sprawl. I wonder if that porch was original to the house? Jenny, I love your blog. I don't always leave a comment, but I come here often to get a fix of the rural life. Yours is one of several that have inspired me to start one in my home town, Dunedin, FL. And because I like yours so much, and the wonderful way you let me experience Sharon, I am putting your link on mine. Thanks for all the wonderful pics. As always, I look forward to the next day's. 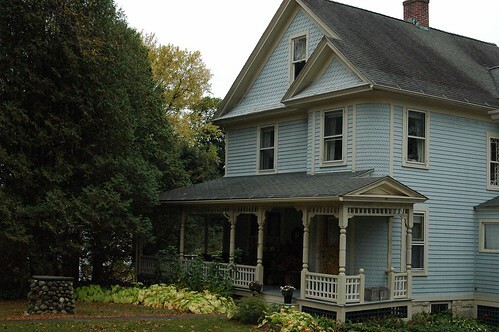 And the house photos are great, an excellent way to get a feel for living in Sharon. Looks like a charming place to live. What a great front porch to while away an afternoon, or a summer evening . . . I have to comment, because it's my house you've pictured. The porch is original and the house is as built. There are a number of Victorians around the Green which were built by the same builder -- Mow. Look at them and you can see the same basic designs livened by different shingling, etc. And yes: Sitting on the porch in the summer, saying "Hi!" to my neighbors who pass is great. Now, though, it looks like I have some leaves to rake.